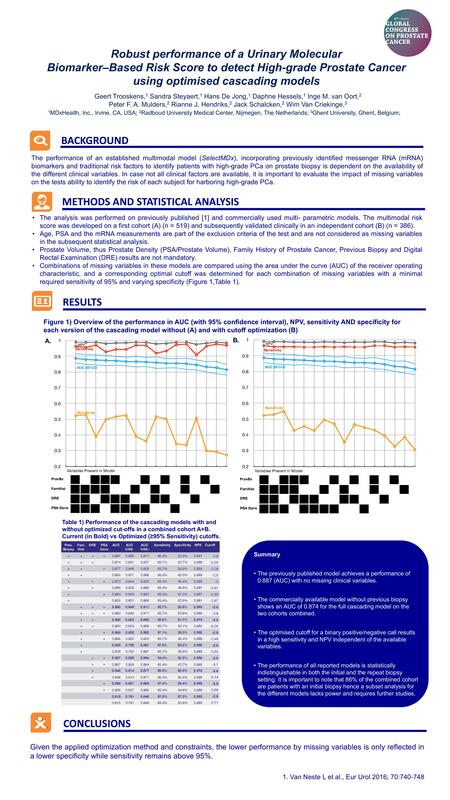 The performance of an established multimodal model, incorporating previously identified messenger RNA (mRNA) biomarkers and traditional risk factors to identify patients with high-grade PCa on prostate biopsy is dependant on the availability of the different clinical variables. In case not all clinical factors are available, it is important to evaluate the impact of missing variables on the tests ability to identify the risk of each subject for harbouring high-grade PCa. The analysis was performed on previously published  and commercially used multi-parametric models. The multimodal risk score was developed on a first cohort (A) (n = 519) and subsequently validated clinically in an independent cohort (B) (n = 386). Age, PSA and the mRNA measurements are part of the exclusion criteria of the test and are not considered as missing variables in the subsequent statistical analysis. Prostate Volume, thus Prostate Density (PSA/Prostate Volume), Family History of Prostate Cancer, Previous Biopsy and Digital Rectal Examination (DRE) results are not mandatory. 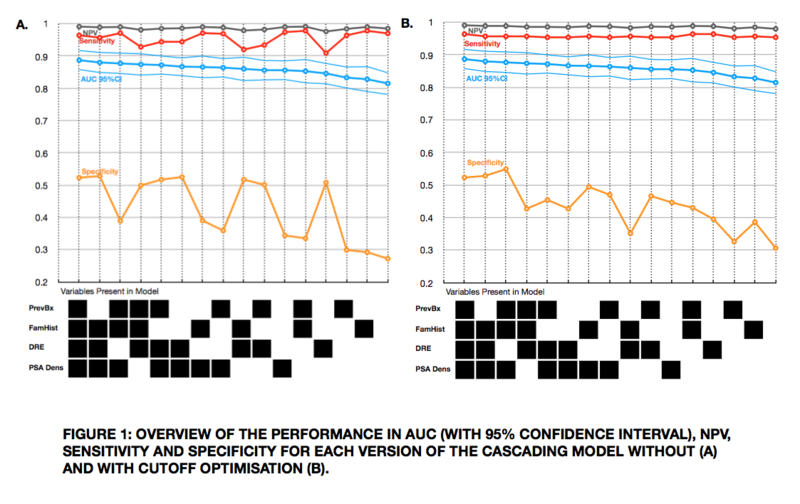 Combinations of missing variables in these models are compared using the area under the curve (AUC) of the receiver operating characteristic, and a corresponding optimal cutoff was determined for each combination of missing variables with a minimal required sensitivity of 95% and varying specificity (Figure 1,Table 1). 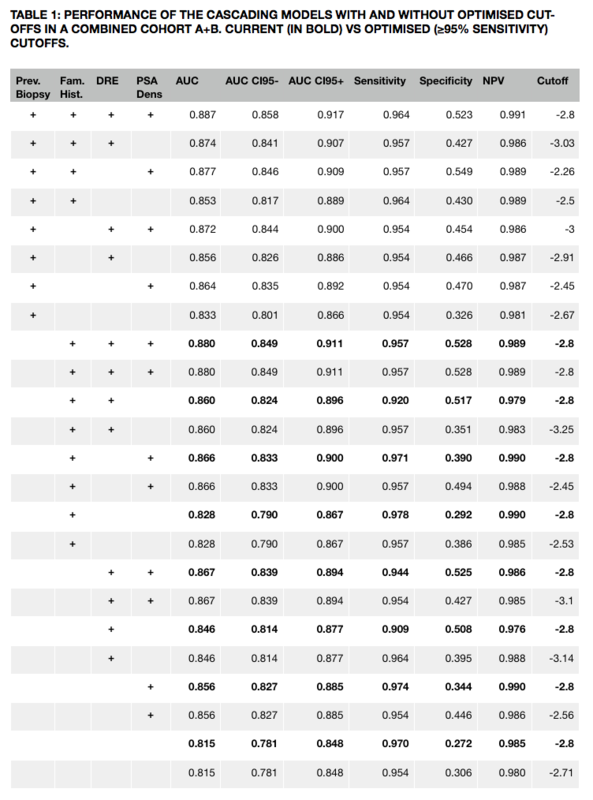 As shown in Table 1. the previously published model achieves a performance of 0.887 (AUC) with no missing clinical variables. The commercially available model without previous biopsy shows an AUC of 0.874 with cascading on the two cohorts combined. The optimised cutoff for a binary positive/negative call results in a high sensitivity and NPV independent of the available variables. The performance of all reported models is statistically indistinguishable in both the initial and the repeat biopsy setting. It is important to note that 86% of the combined cohort are patients with an initial biopsy hence a subset analysis for the different models lacks power and requires further studies. Given the applied optimisation method and constraints, the lower performance by missing variables is only reflected in a lower specificity while sensitivity remains above 95%.